Senior Researcher, Doctor of Science, Leader of the "Molten Globule" Group. 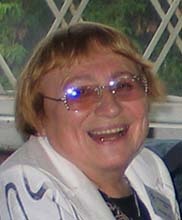 Valentina E. Bychkova was born 11.08.1934 in Leningrad (USSR). She graduated from the Leningrad State University, Physics Faculty (1957). Ph.D. thesis title: Conformational transitions of copolymers from L-glutamic acid with hydrophobic amino acids. (1976) The Moscow Institute of Technical Physics. Dr. of Sciences thesis title: Intermediate states in protein folding and their functional role. (1998) The Moscow State University, the Biological Department. Protein Physics, Protein Folding (Equilibrium Protein Unfolding, Folding Nucleus, Transition States), the Molten Globule State, Intermediate States in Protein Folding, Functional Role of the Molten Globule in the Cell, Genetic Diseases.